My name is Dmitry Tumanov and I live in Toronto, Canada. 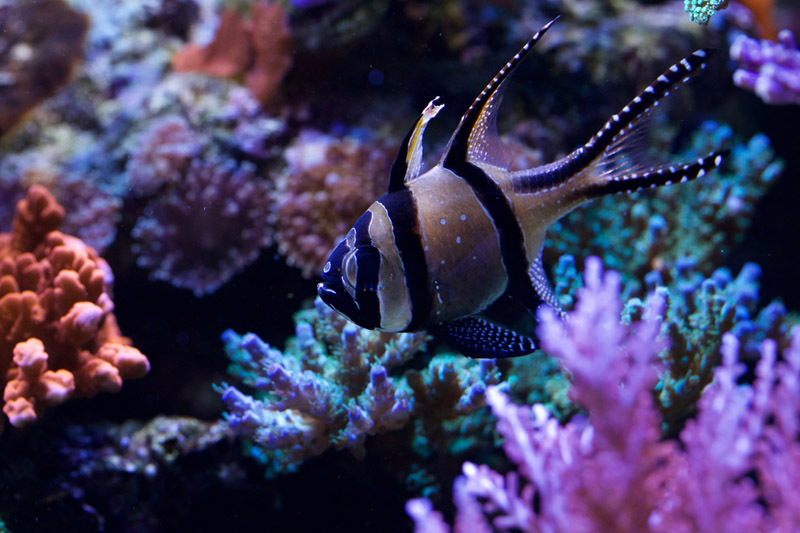 I feel deeply honoured to have been picked for ReefCentral’s Aquarium of the Month feature. 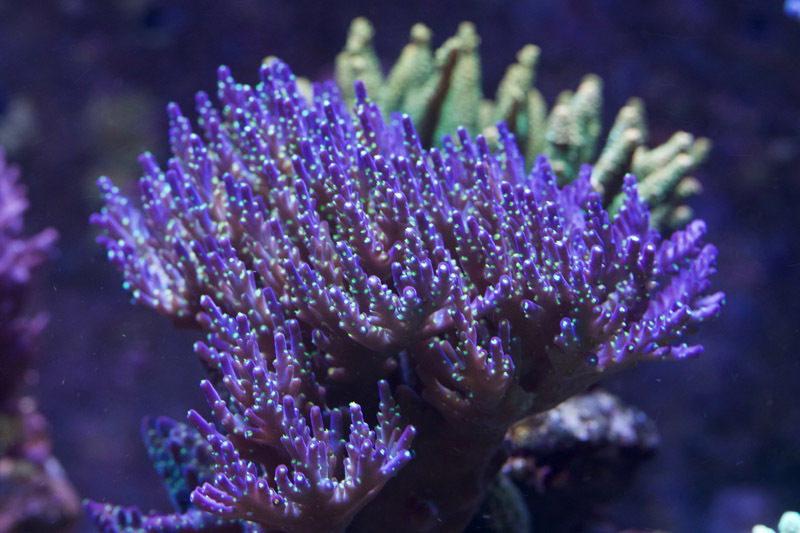 I have gotten a lot of great ideas for my reefs by reading TOTM articles and until this day this remains one of my favourite things to read on the internet. There is just something about getting a behind-the-scenes tour of a successful tank, each one being a unique pinnacle of dedication and skill. 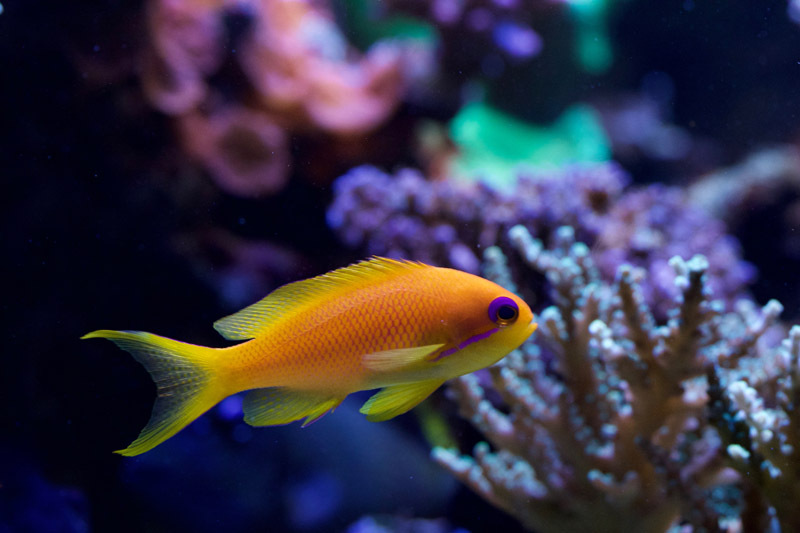 My fascination with aquariums had started when I was 5 years old. 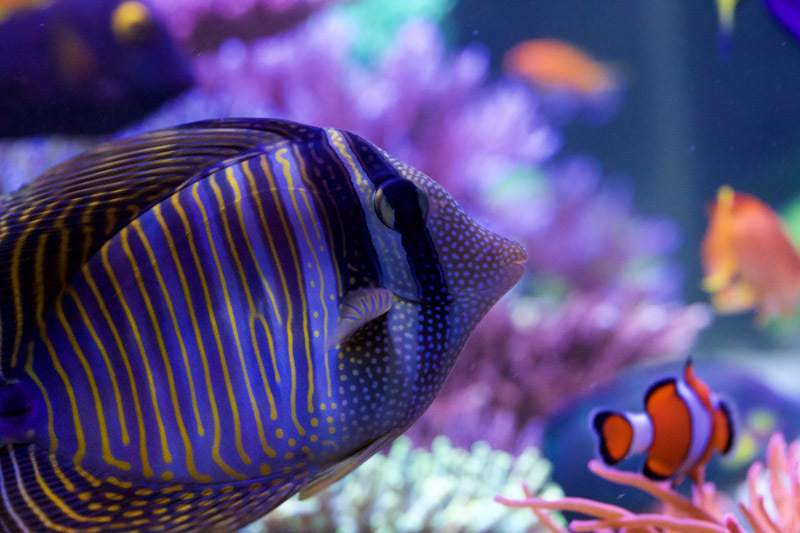 I vividly remember visiting my neighbour’s flat and seeing a beautiful planted tank full of live green plants and colourful aquatic creatures. Multicoloured guppies, neon tetras, red swordtails and awesome looking corys - I was immediately hooked. Very soon I was trying to reproduce the experience by successfully keeping a quarter-sized wild caught waterbug in a 3 litre jar for about a year, then proceeding to guppies. Back then literature was scarce, so there was a lot of trial and error. 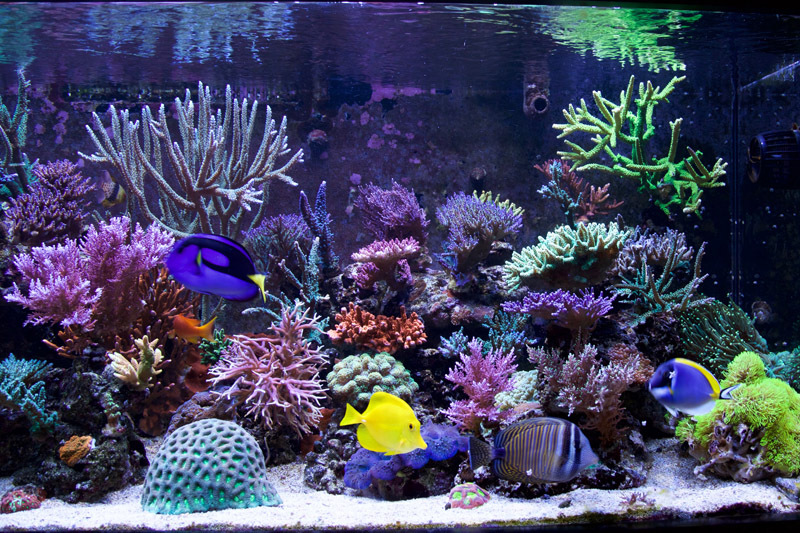 Fast forward to the late 90s and I purchased my first 10 gallon freshwater tank that quickly morphed into a 25 gallon tropical. 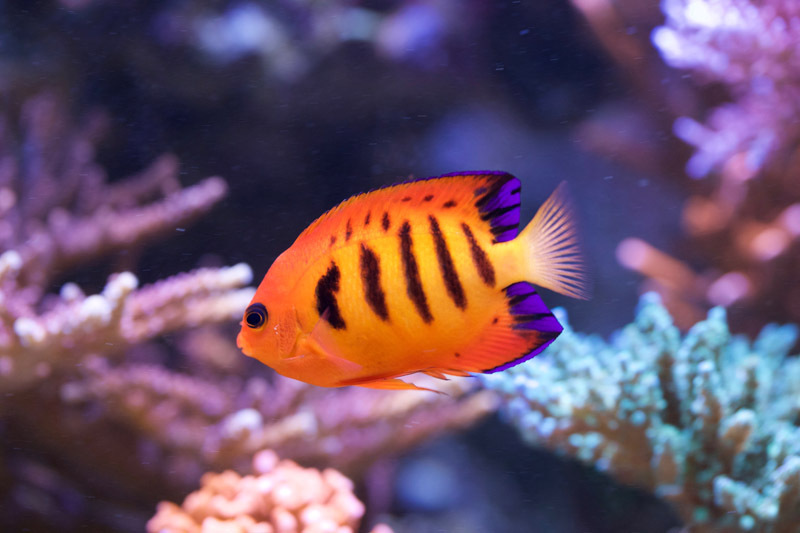 Then it was dwarf cichlids, followed by African cichlids in 75 and 125 gallon aquariums. At some point I had six active tanks in my household. 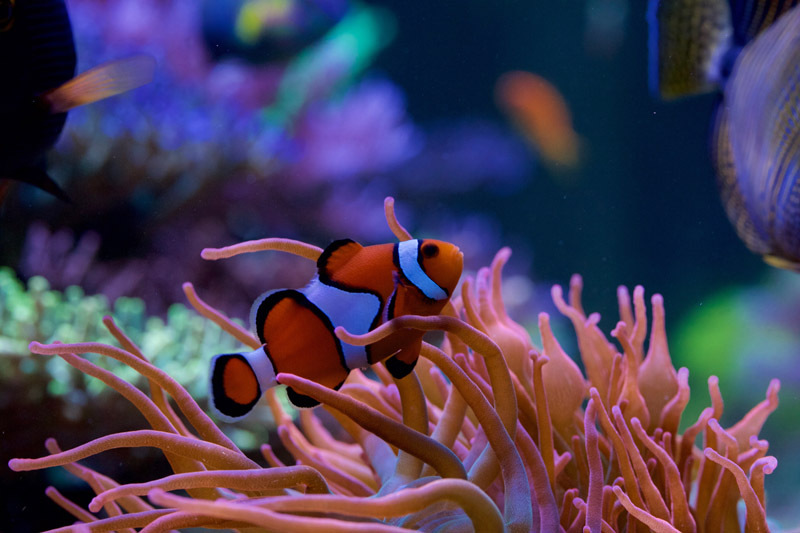 I even tried keeping a saltwater fish-only tank with a single clownfish for a few months. Always yearning for more challenge I got into Amano-style planted tanks and that had kept me busy for another 3 years. 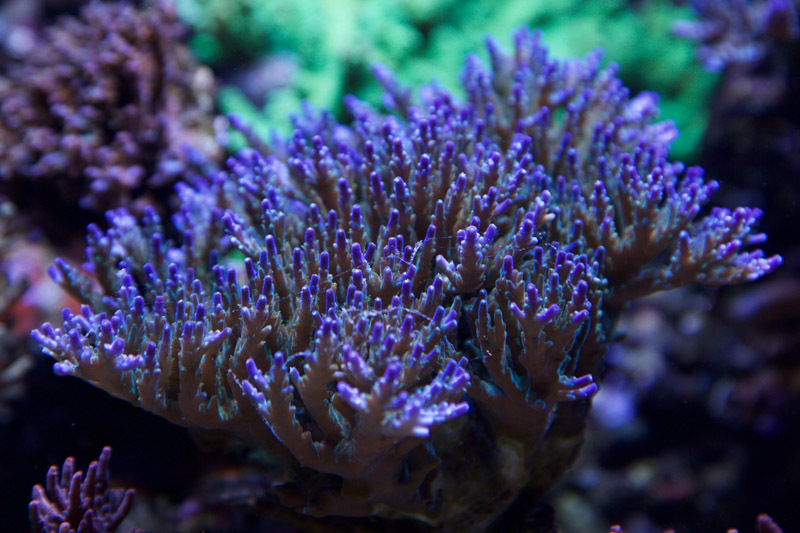 But in the back of my head I knew that there would be a reef in my life. 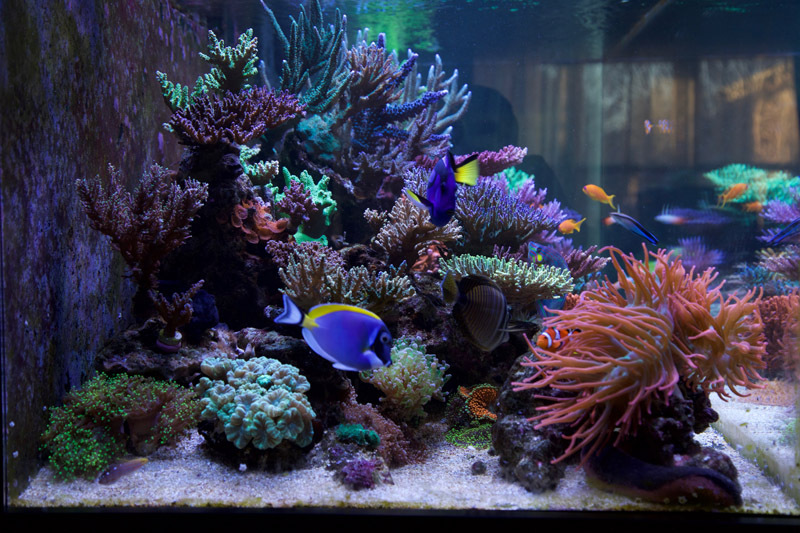 In 2011, I setup my first 10 gallon reef. 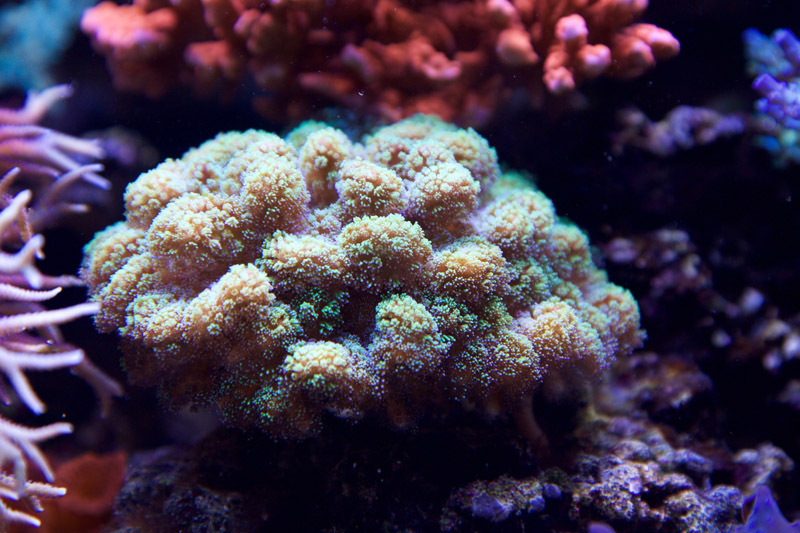 It only lasted for a couple of months until I decided to get an AIO 28g cube which I truly consider to be my first real reef. 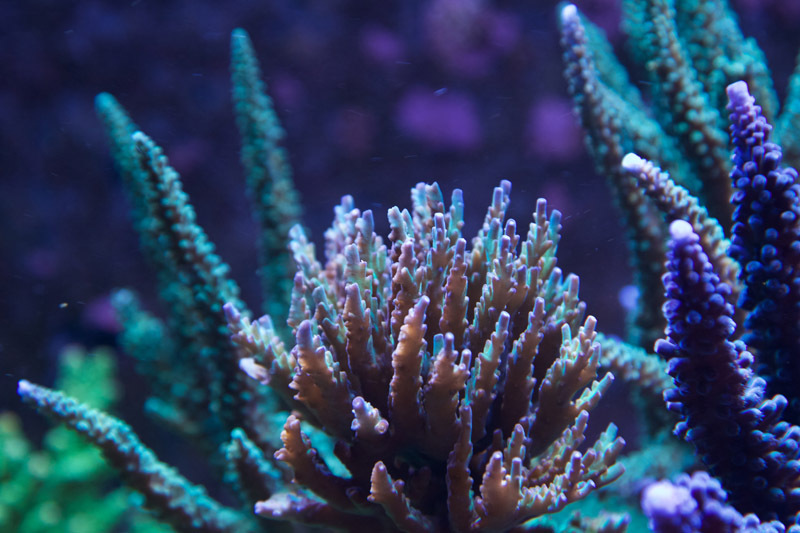 That first experience of mixing saltwater, putting the first hermit crab in, the first saltwater fish, and finally the first coral (and finding out what really is a coral) was fascinating and rewarding. 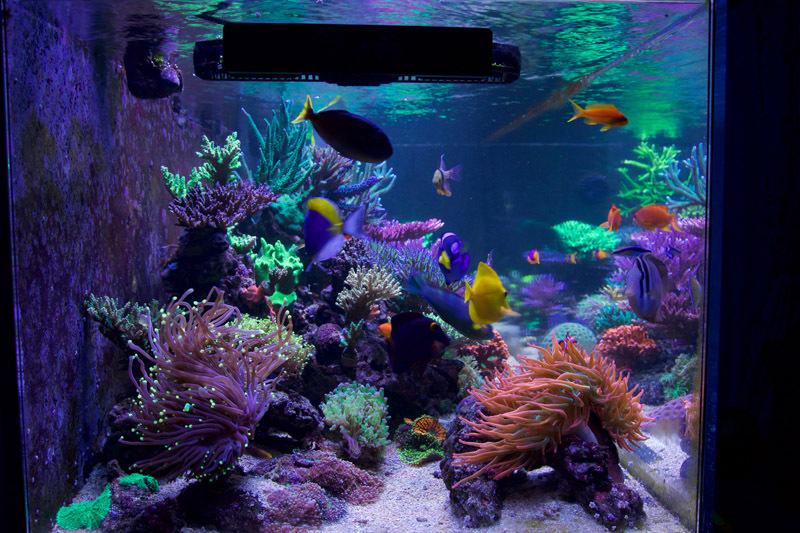 It only took six months for it to get fully stocked and about a year later I got myself a custom built 100 gallon aquarium called 'Winterfell Reef' (Game of Thrones was strong that year). 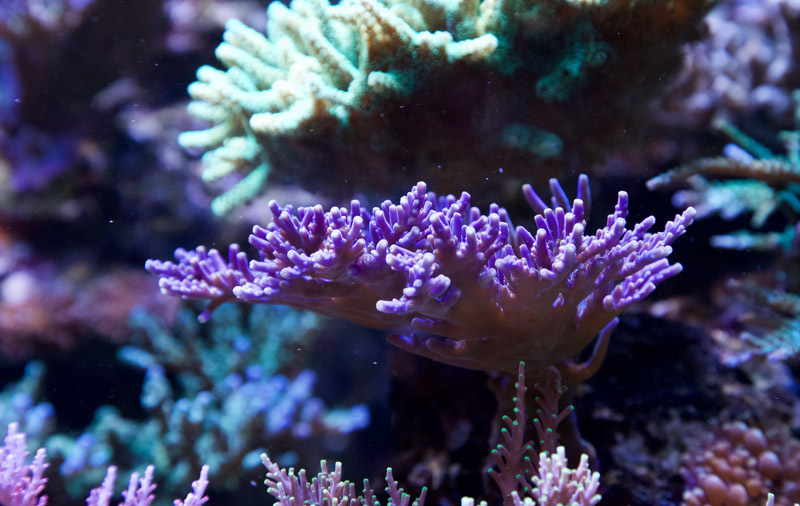 As you can imagine, even 100 gallons can get too small too soon, so in early 2014 'Pragmatic Reef' was born. My 100 gallon was 48in x 24in x 20in and I wanted to be pragmatic about the upgrade, so I had added two feet to the length and two inches to depth and height of the new tank. The tank is now 2 years old and has been a fun, educational, humbling and fascinating experience. 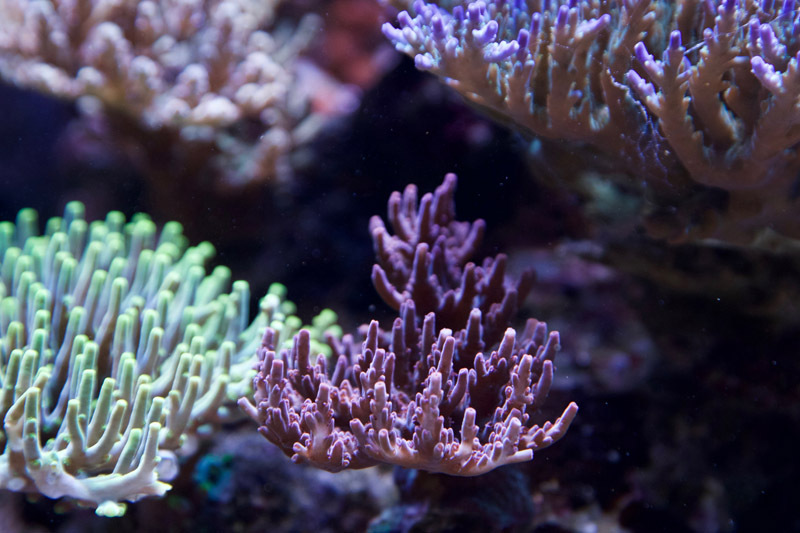 It is primarily geared towards SPS corals. 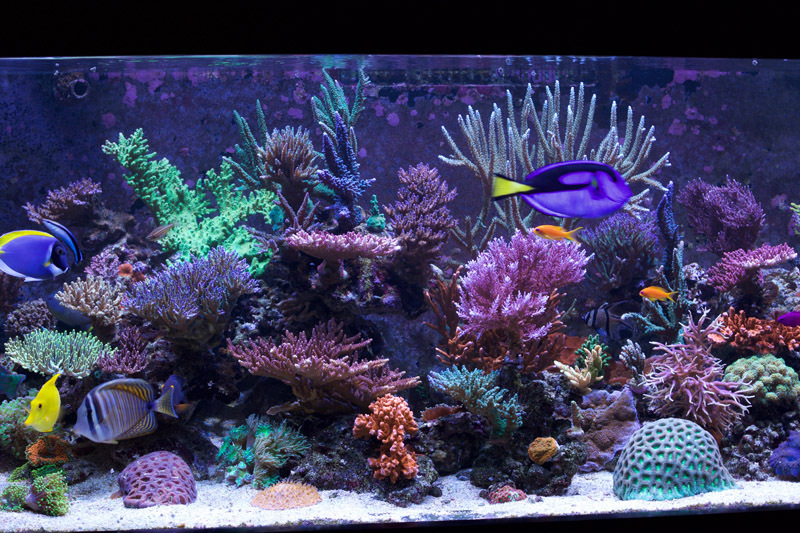 I wanted to be as pragmatic about this reef tank as possible, that meant making maintenance simple and automating as much as possible. 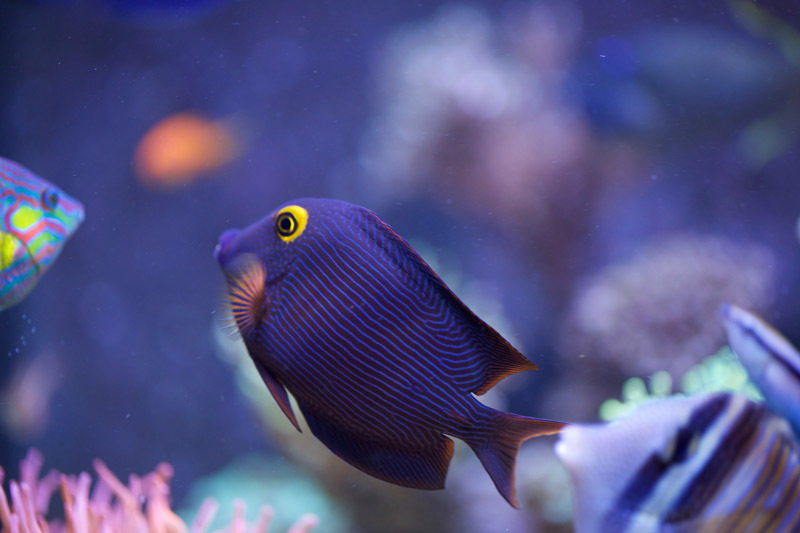 Water changes are being performed automatically and result in stable water parameters. 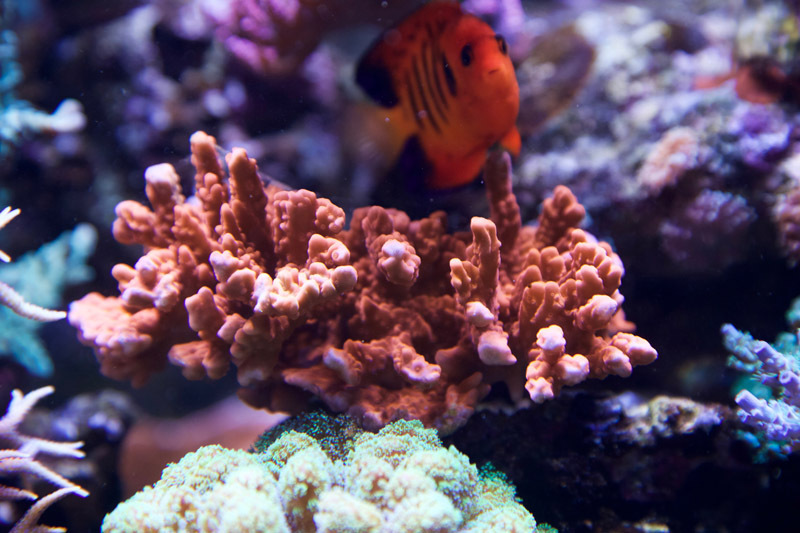 Original aquascape was just two large piles of live rock. Having been inspired by a couple of local reefers I had taken all of the live rock out and have formed modular pillar-like structures that have changed the aquascape dramatically - now the fish swim not only above the reef but also underneath and between the corals giving it a 3D experience. 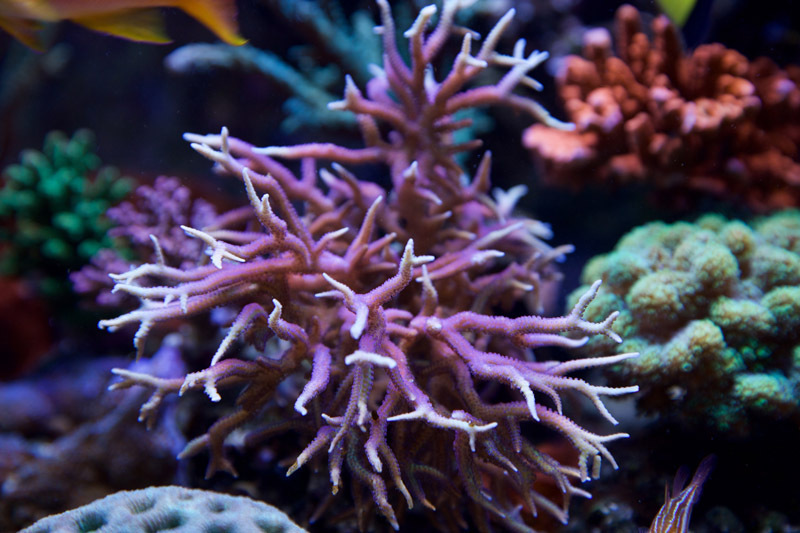 I have also re-thought the way I’m attaching corals to the rock - now every colony is pegged on a small acrylic rod that goes into a hole in live rock. 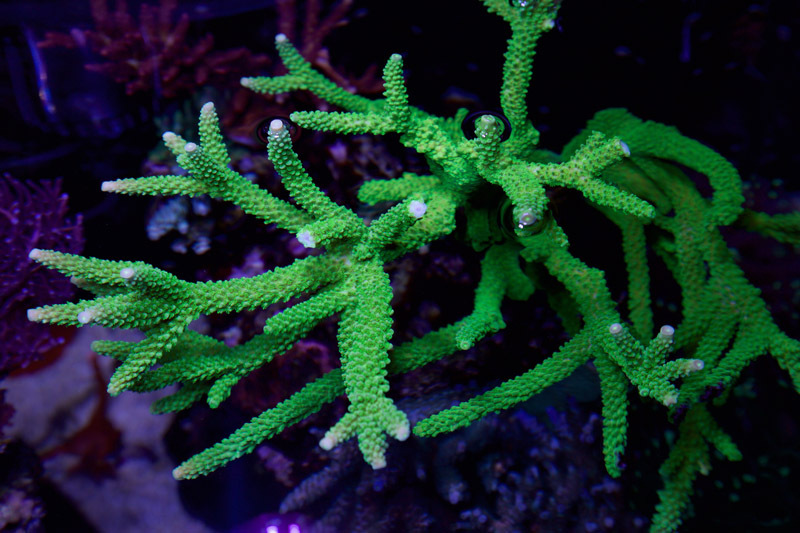 This gives me an ability to move any coral I want and makes is much easier to frag. I have been using Reef Crystals salt for the past couple of years and find it fairly decent. 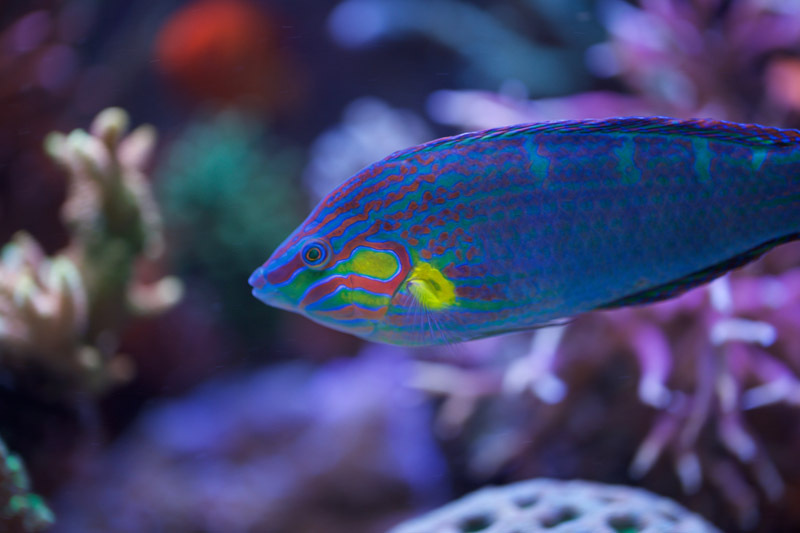 I’m quarantining all of the fish that go into the tank and do rigorous dipping and cleaning of corals before putting them into the aquarium. 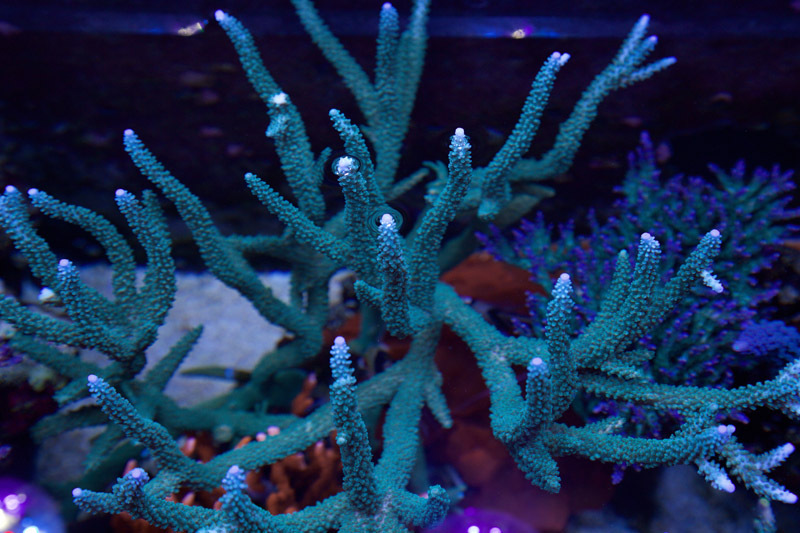 I also re-glue all new corals onto new plugs, do thorough dips and brushing before adding them to the tank. I am using AquaticLog website for all of my water measurements, weekly maintenance and reminders. Whether it is pen and paper, an Excel spreadsheet or an online tool, I’ve found it is crucial to keep logging water parameters and is a habit I follow until this day. 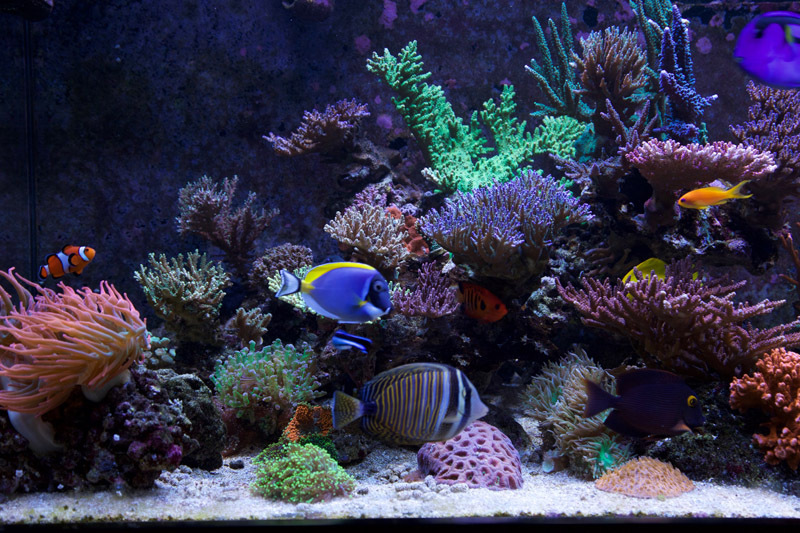 I started this reef with Radion LEDs for the first 2 months. 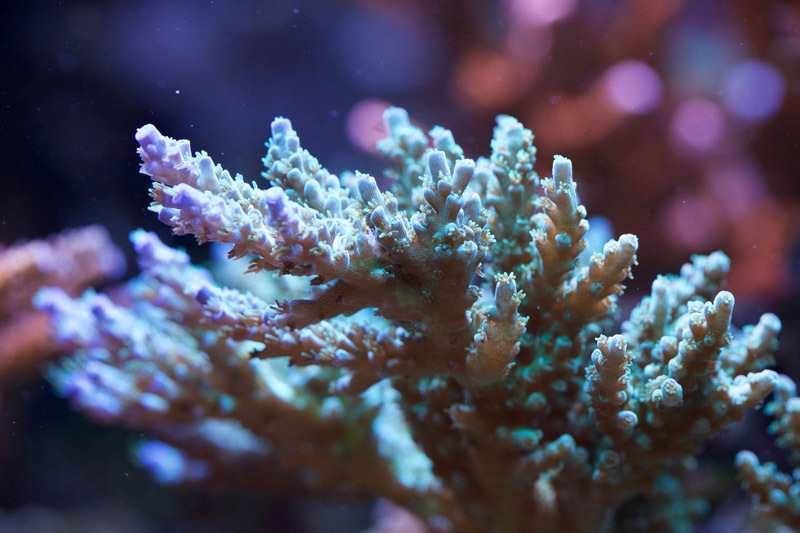 My goal since day 1 was to keep challenging varieties of SPS acropora corals and with LEDs there were just so many parameters to be mindful of - light intensity, light duration, light spread and color spectrum, changing any one of these parameters will significantly affect water chemistry and coral health. 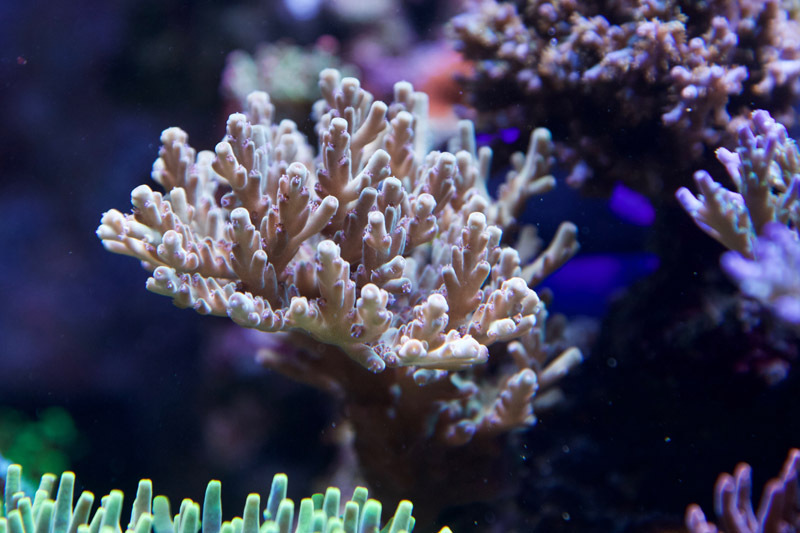 When looking at many brown corals in my tank I did not know whether it was because of water quality, water movement, lighting or simply a new tank syndrome. So I decided to put on a tried and true 8-bulb T5 fixture on the tank in a set-and-forget mode thus eliminating one of the variables. 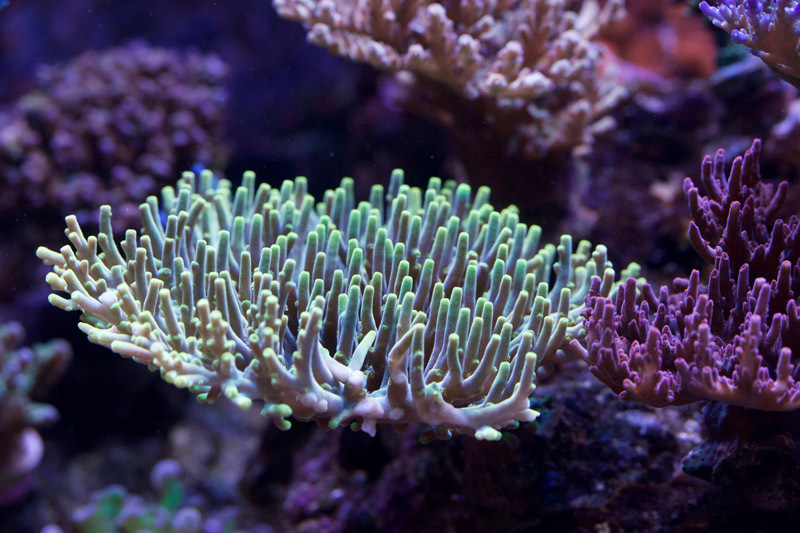 This proved to be a good move and in about 8 months I got some amazing color out of most SPS; even more challenging pieces started to show amazing colours at about 14 month mark. I have also setup a frag section in the sump underneath the tank lit by Radions and started to experiment with the light intensity and spectrum there. 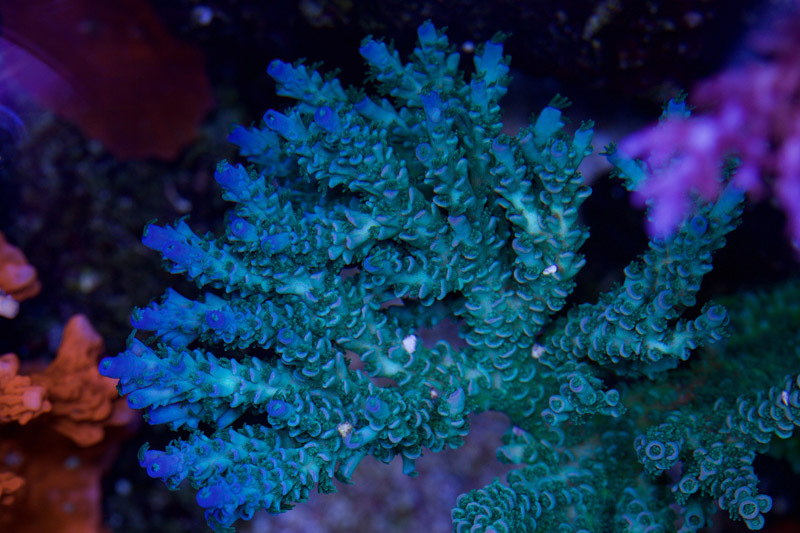 It took six months of trial and error until I started to get good color in my frags. 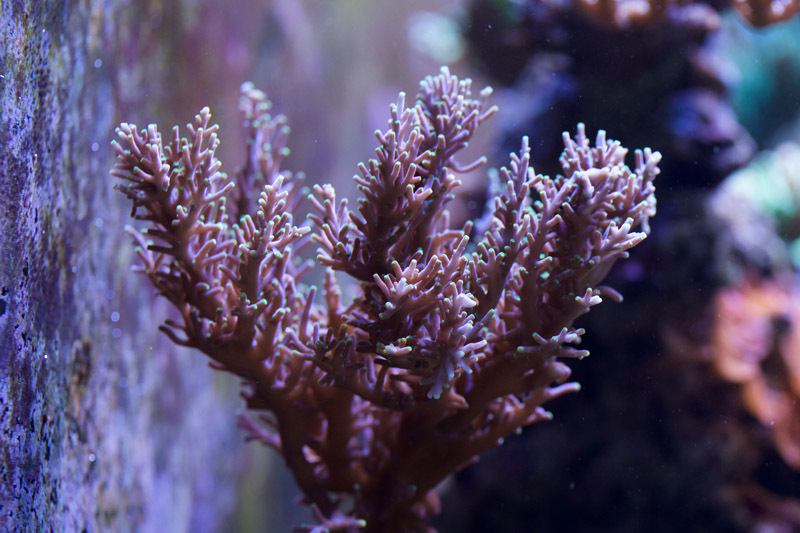 Eventually I had it dialled-in in such a way that any coral I would frag from the main display would not lose its coloration in the frag tank. 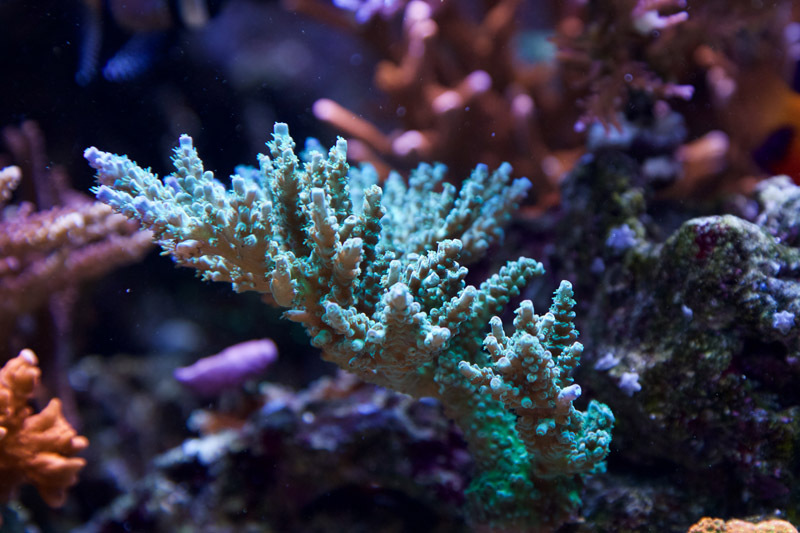 Here is a few things I have learned about lighting the tank with Radions: PAR can be extremely low - for about 8 hours I would run only blue channel at a 100% giving me PAR of 220 and another hour of turning on whites to get a more natural look that would give me a chance to examine true coral colours. Having a PAR meter turned out to be indispensable - I was able to ensure proper light coverage and intensity. 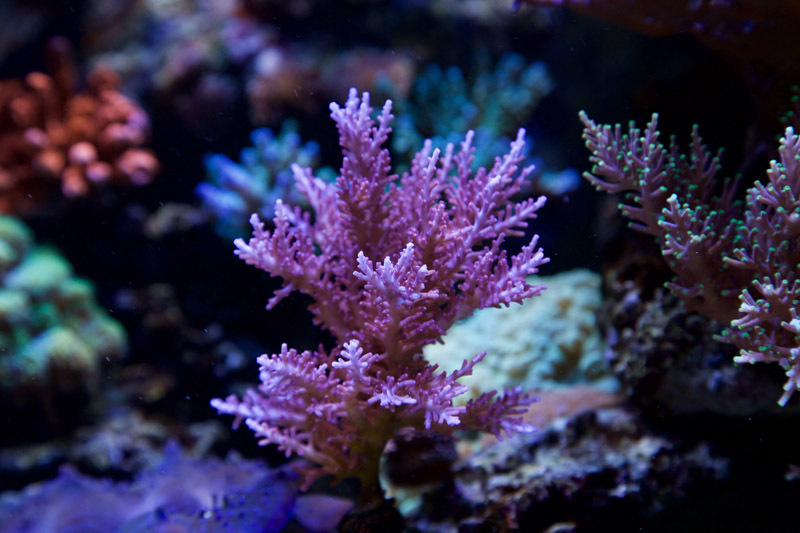 Once I’ve learned these tricks I was able to keep any high-end acro I wanted, bringing in corals that were grown and coloured under Metal Halides and not losing any color. At the end of the experiment I would consistently get a better color under LEDs than under T5 to everyone’s surprise. Having run this for a year I finally decided to upgrade my main tank lighting to Radions and as of this writing I’ve been running them for over a month with good results. One of the chambers in the sump is filled with live rock and has a gentle flow through it. 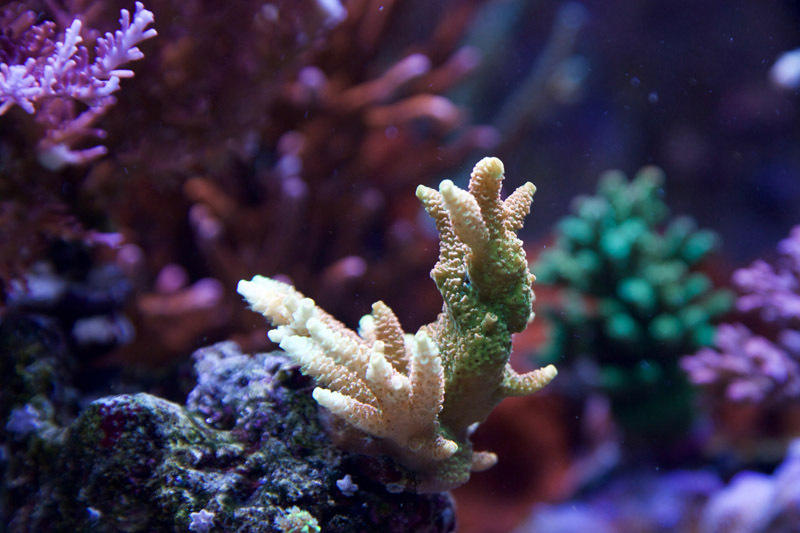 There’s no light over it and that gave tremendous growth to various benthic organisms, starfish, sponges and worms. I must admit that I really enjoy examining these rocks that are full of life. 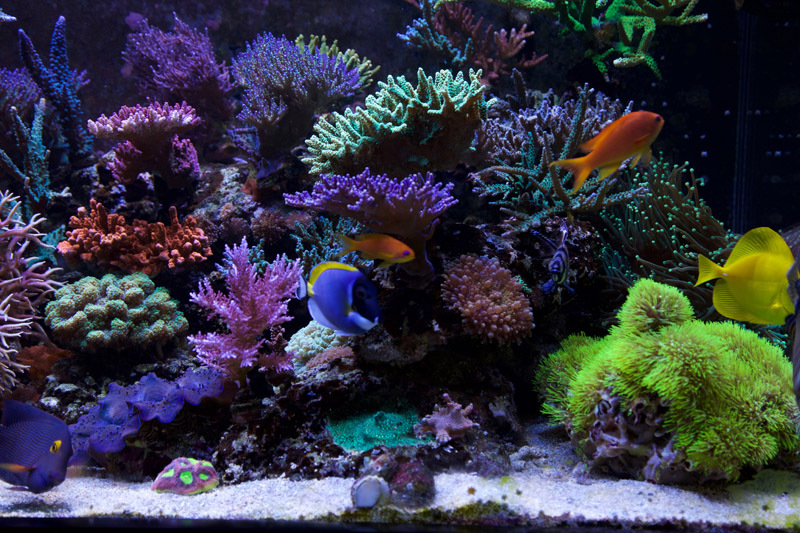 Biological filtration provided by tons of live rock and some ceramic media allows me to keep a large number of fish and feed the tank generously. Water circulation in this tank is quite unusual. There’s a very gentle flow from two oscillating returns (Vertex Moceans). Real water motion is caused by a Maxspect Gyre 150 and a single MP40 QD. Only one of them is running at a time at a 4 hour period. Due to my open scape having a single powerhead take care of a 180 gallon tank seems to be enough. Another tank anomaly is a complete absence of nitrates. I’ve always had detectible phosphates and tried sometimes to bring them down by throwing some GFO in the sump. My nitrates have always read zero. About a year ago I’ve started dosing potassium nitrate and right after my SPS colours have improved significantly. Now I try to achieve just detectible levels of both nitrates and phosphates and keep them there. I have experimented with many different additives over the years but in all honesty could not see a reproducible and noticeable result. 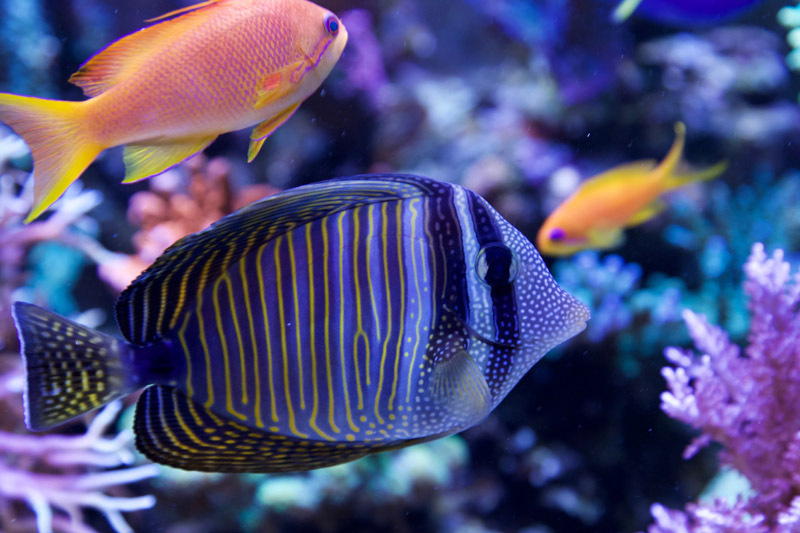 There’s just too many variables in the tank to notice a significant change. In the end I’m just dosing quality 3-part solution and some potassium nitrate. 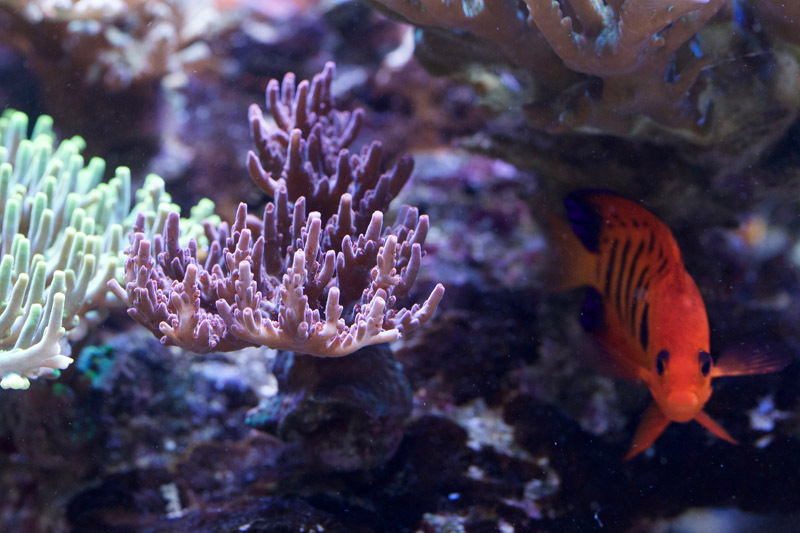 My large fish bio-load and frequent feedings provide enough nutrients to corals. 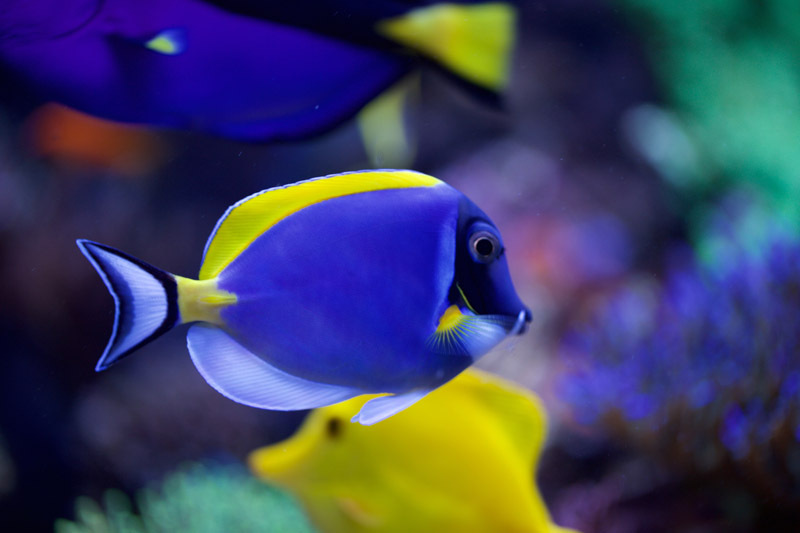 There are 5 tangs in the reef: kole tang, powder blue tang, blue tang, yellow tang and sailfin. 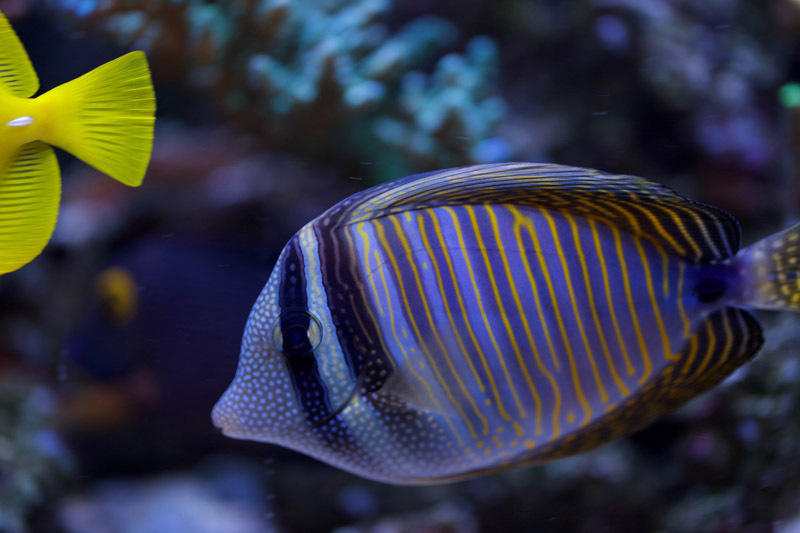 Each one has been carefully chosen for their characteristic: kole tang is the workhorse in the aquarium and is keeping the tank free of any algae. 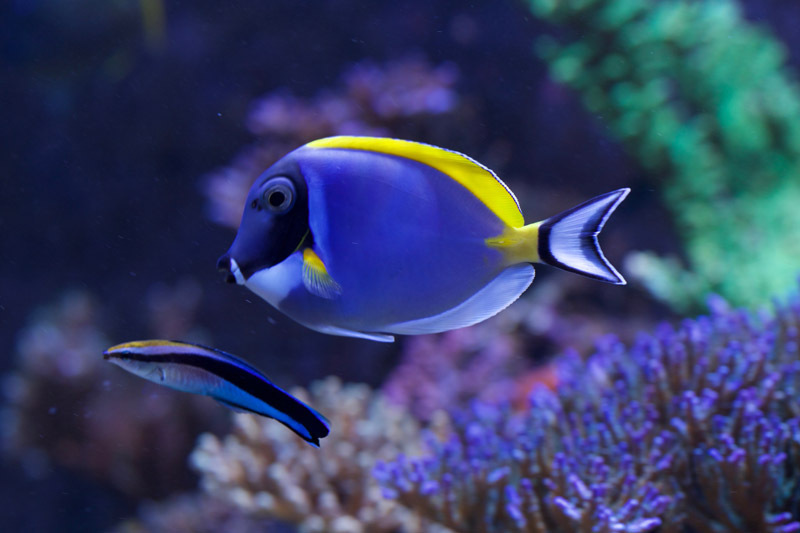 Powder blue tang is my favourite - it is the reason I got into the saltwater in the first place; I had to go through 7 of them (all quarantined) before one had survived. 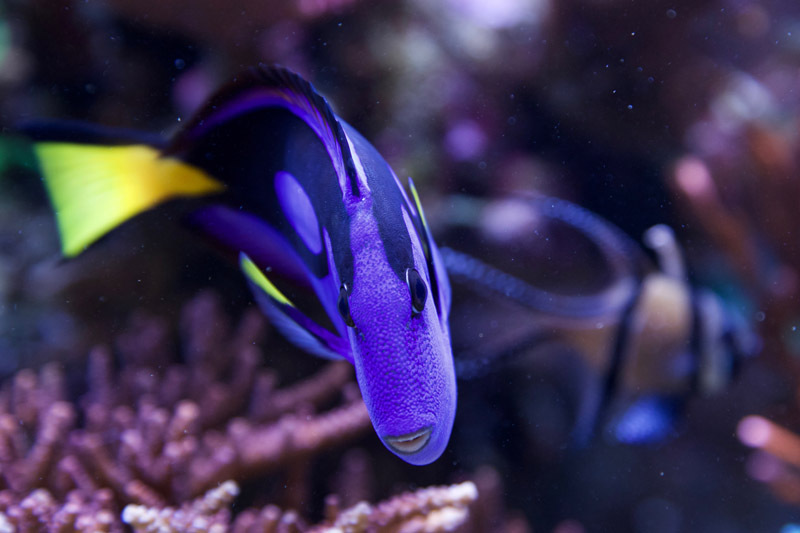 Blue tang is there because every Nemo needs a Dori. 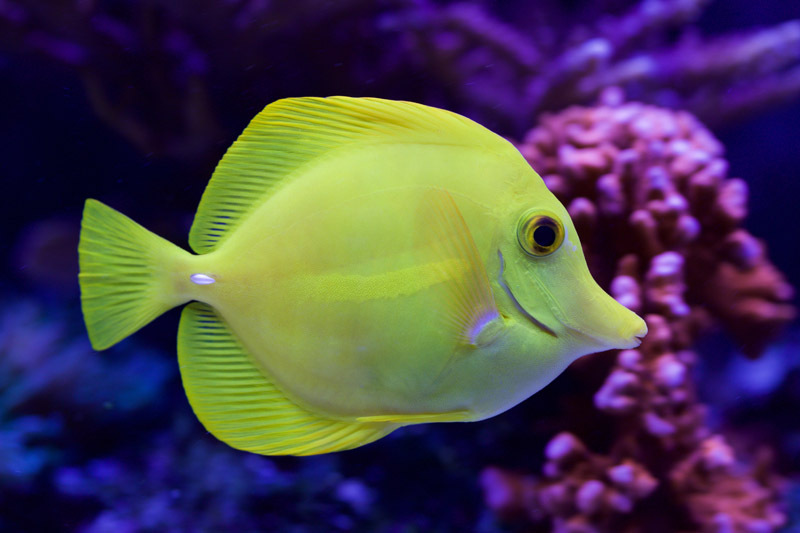 Yellow tang is simply beautiful and sailfin tang has gotten rid of bubble algae in the tank. 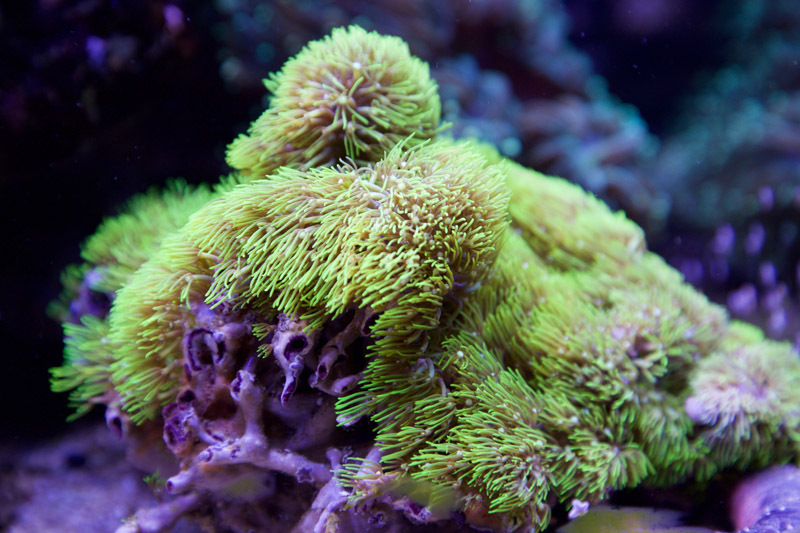 I have got a pair of clownfish that were trained to host in a bubble tip anemone that’s positioned on its own little rock island (this ensures that it does not crawl over onto other rocks with SPS corals). 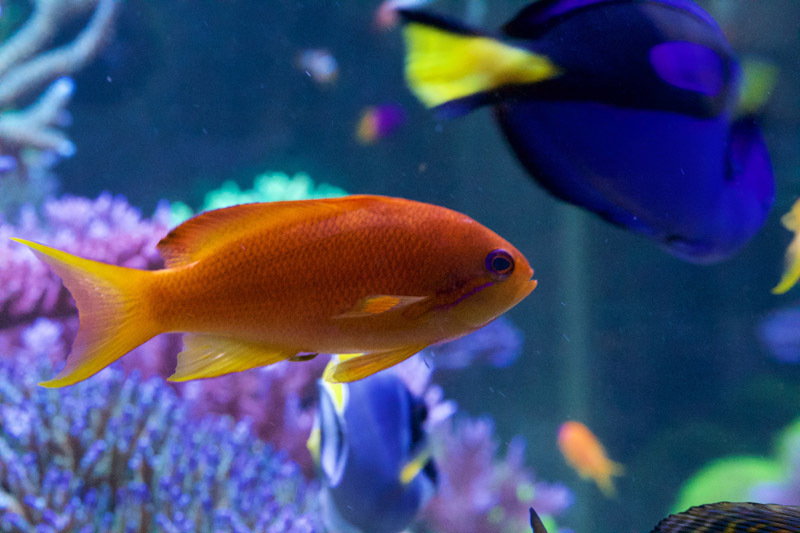 Last six months I have introduced 4 lyre tail anthias that have added a lot more character to the reef (3 more are in quarantine as of this writing). 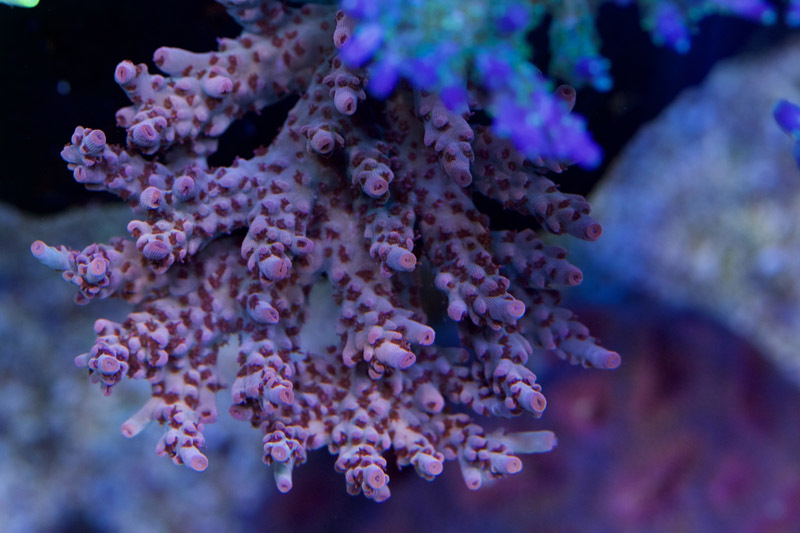 The tank’s main focus is colourful SPS species, primarily acropora. I’ve started off with a lot of simple acros and montis, but have replaced most of them over the years. 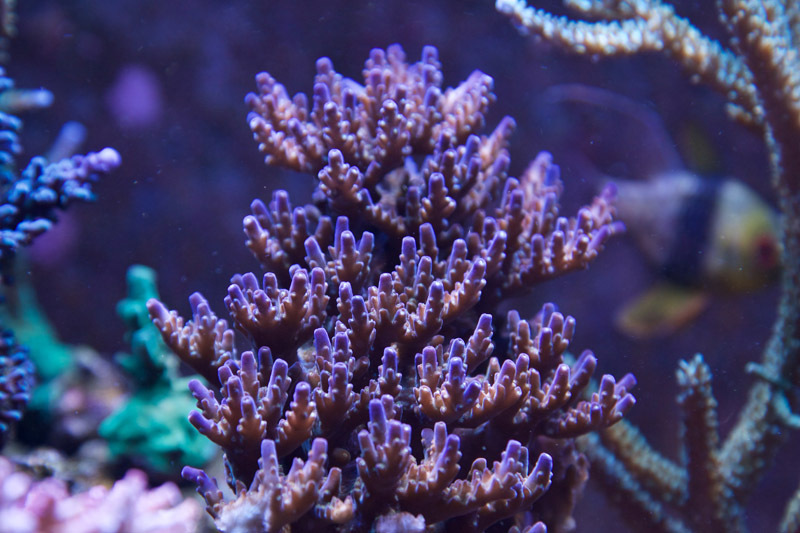 Almost every coral has been grown from a frag. My tallest staghorn is about 19’’ high. 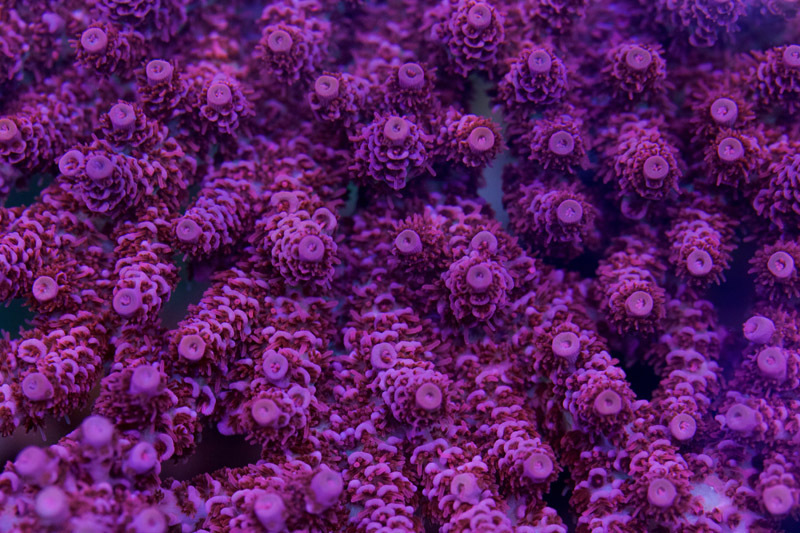 SPS corals include: various birdsnests, Green Slimer, Strawberry Shortcake and Strawberry Milkshake, ORA Voodoo, Orange Setosa, Sunset Millepora, Tri-Color Valida, Bonsai and many other fancy names. Some coloured up easily yet a few pieces took over 18 months to develop good color. 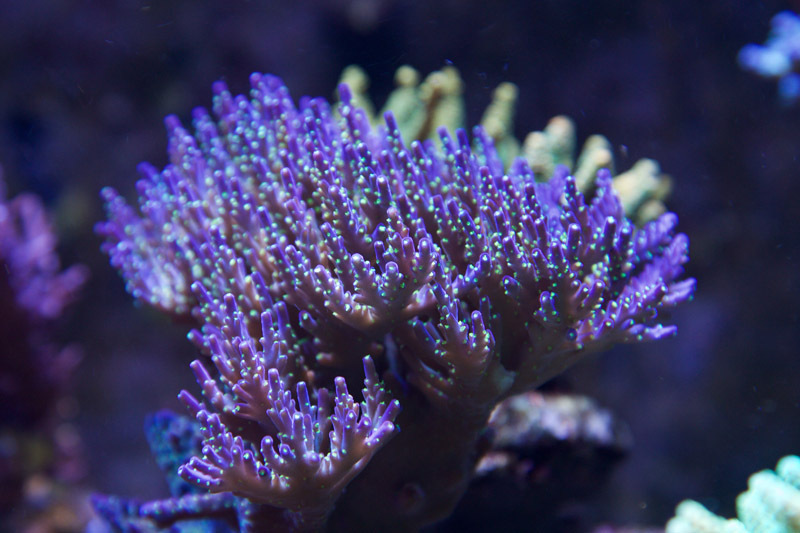 LPS corals are doing ok in the tank but not great. 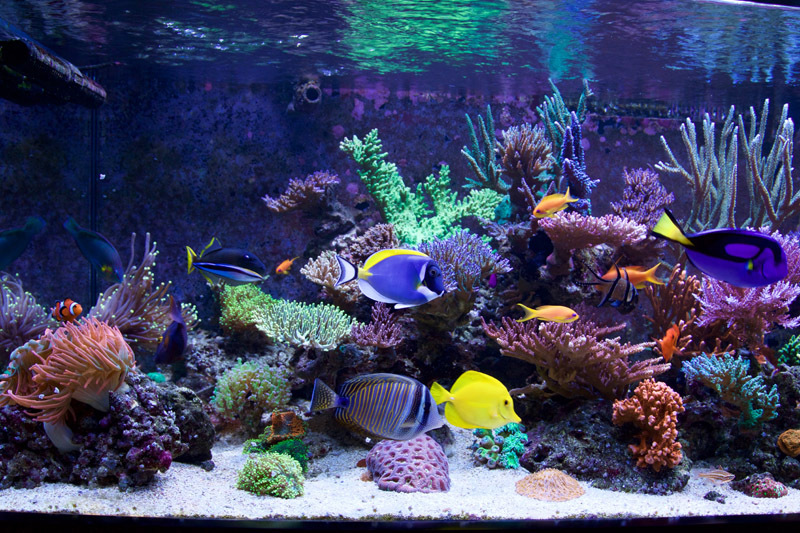 Water changes are automated at 10% per week. I clean the glass every 3 days, replace carbon every 2 months or so. Since the beginning I have been feeding primarily rinsed frozen food (mysis shrimp, cyclops and brine shrimp). 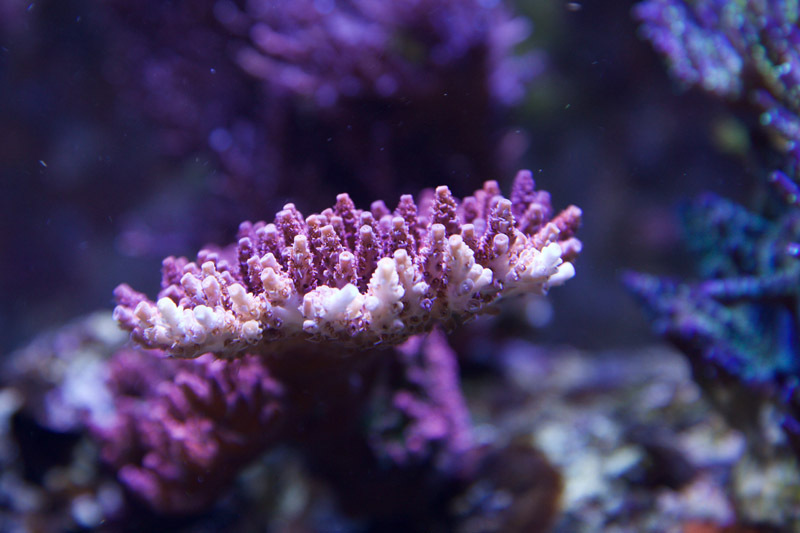 I do not feed my corals regularly, but only occasionally with coral-specific food such as PolypLab Reef-Roids. 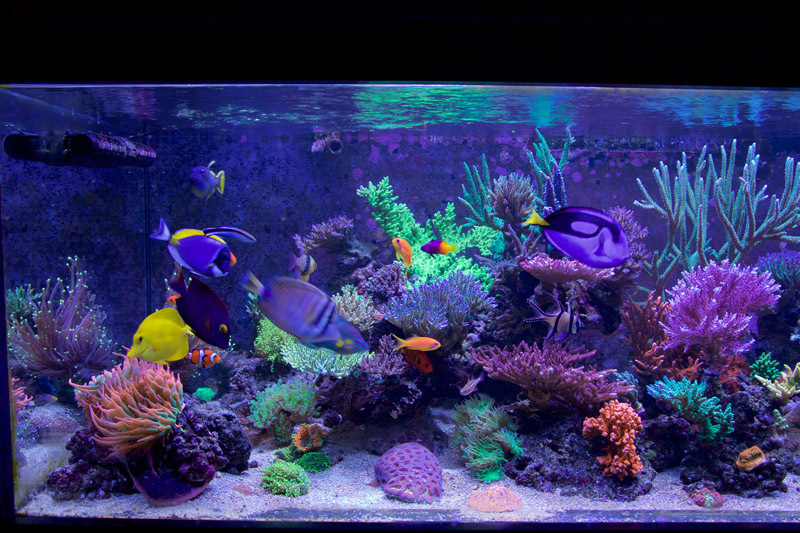 On average my tank gets about 6-8 cubes of frozen food per day. Tangs get a sheet of nori every couple of days. There is a lot of people I want to thank for their support and help with this hobby. 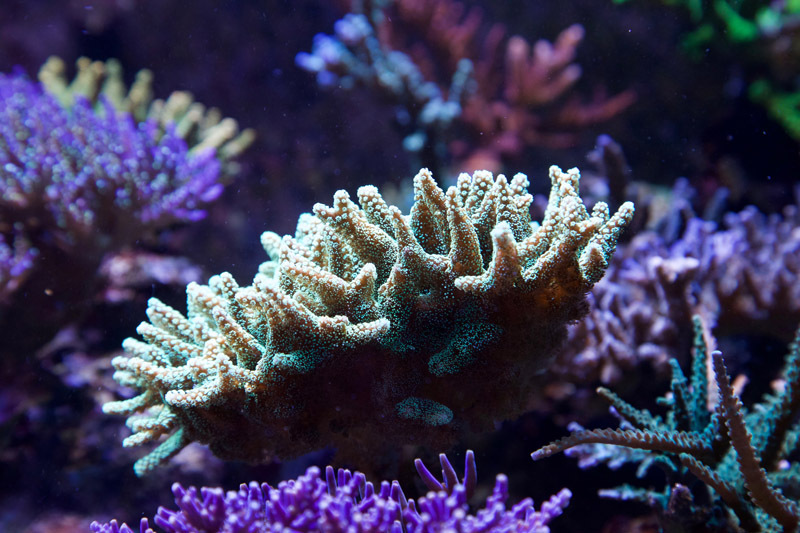 Numerous reefers in Greater Toronto Area and local marine club (MAST) members have helped with their advice, example and frags. I want to thank a few manufacturers as well for making great products that I use daily and for their technical support. I want to thank various online communities for their words of encouragement and suggestions. I also want to thank all of the authors of marine books out there (I have quite a collection) and magazines. And most importantly I want to thank my wife and kids for their support and understanding when it comes to such an expensive and time consuming hobby.